Click "Add File" button to load the video files that you want to convert. You can choose the output format from the profiles drop-down lsit. You can set Encoder, Bitrate, Channels, Resolution and so on by clicking "setting" button. Click "Start" to begin the conversion with high output quality and converting speed. 4Easysoft MTS Converter can not only convert MTS, but also TS, MOD, and various HD videos to regular videos. Click "Add File" button, you can add the video files that you want to convert. 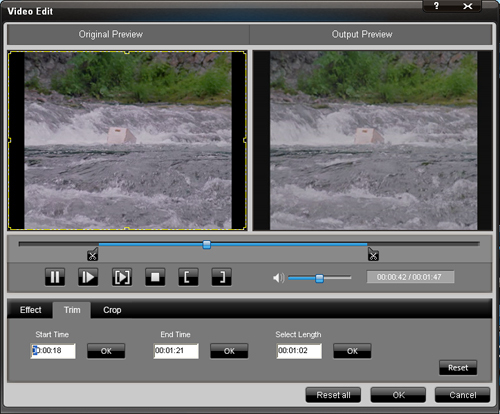 You can choose the output video format from the drop-down list button. You can set Encoder, Bitrate, Channels, Resolution and so on by clicking "Settings" button. You can choose the output folder by clicking "Browse", or the defalt folder is D:\My Documents\4Easysoft Studio\Output. Click "Start" button, you are allowed to start conversion. All the tasks of conversion will be finished at fast speed and high output quality. Click "Effect" button, you can set the video Brightness, Contrast, Saturation and check the Deinterlacing which helps you to optimize the video effect. 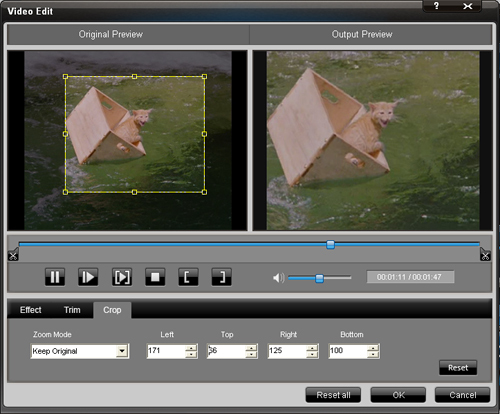 Click "Crop" button and you can crop videos by selecting a crop mode, adjusting the crop frame, or setting the crop values. 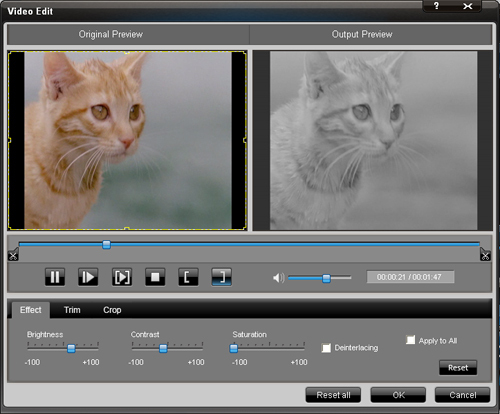 Click the "Preference" button you can select the output destination, the Snapshot foler, the format of the snapshot image,etc. Just click the "Snapshot" button, you can save any picture you like when you are previewing videos. This converter can help you convert among all mainstream video and audio formats and help you take videos easily on PSP, PS3, iPod, iPhone, Apple TV, Xbox or other digital devices.